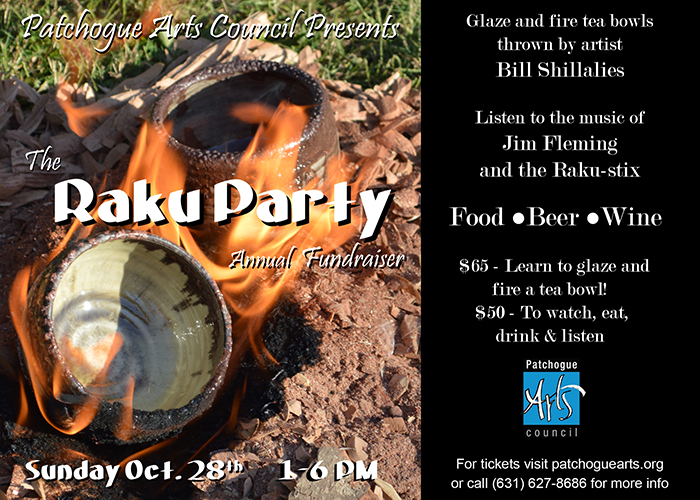 Event: "Raku Party" | Patchogue Arts Council, Inc.
Raku is a modern adaptation of an ancient Japanese firing technique. Glazed bisque ware is rapidly brought to high temperatures, and while the pieces are red hot they are removed from the kiln and placed into a bed of saw dust. Flames erupt, which are quickly snuffed out by placing a large pail over the fire. Robbed of oxygen, the fire seeks other sources in the clay body and glaze causing unique effects such as iridescence, much as rust can be returned to iron by ‘reducing’ oxygen or as fireworks burn bland metallic oxide powder into intense color. Each participant will receive a ‘glaze ready’ bowl and will apply personal and unique glaze patterns. After the pieces are ‘rakued’ there is a brief cooling period after which they are scrubbed and ready for home delivery! Food, beverages, beer, music, and the company of interesting people are available for only $65 while you support the work of the Patchogue Arts Council. Additional pots will be available for $20. Have enough pottery? You may enjoy the process as an observer for $50. All proceeds go to the Patchogue Arts Council. This year we are pleased to have the musical talent of the Jim Fleming and the Raku-stix; sparks will be flying from the stage and the kiln! Spaces are limited so reserve your place soon. Please make checks payable to The Patchogue Arts Council, or email info@patchoguearts.org or use the paypal button on this page.